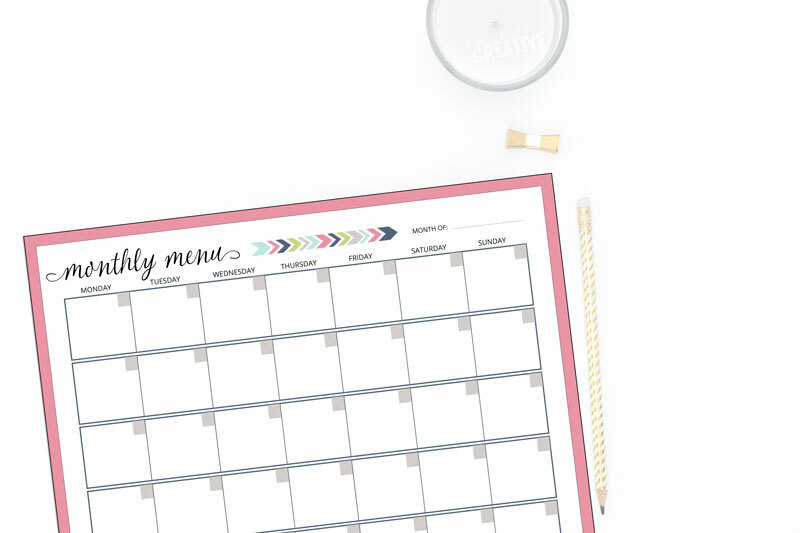 Snag your free printable meal planner to download and use to take control of your evenings and never ask yourself what’s for dinner again! This post was originally published March 2016, but has since been updated and revamped! Do you want to save time and money at the grocery store? Are you tired of letting good food go to waste? Do you struggle with the task of deciding what’s for dinner each night? I was in the same position as you not too long ago. One way I tackled each of those problems was with meal planning. Not only do I have an answer to the daily “what’s for dinner” question, but I can stick to a grocery budget easily. That’s why I’ve created this free Meal Planner to share with my email subscribers. 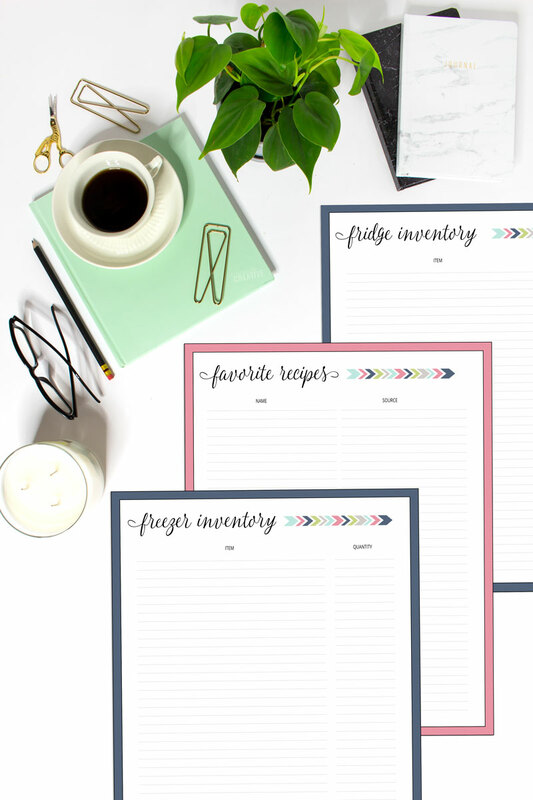 With this binder you’ll get a printable PDF that includes a monthly and weekly meal plan template, blank grocery list, pantry/fridge/freezer inventory sheet, and favorite recipes sheet. 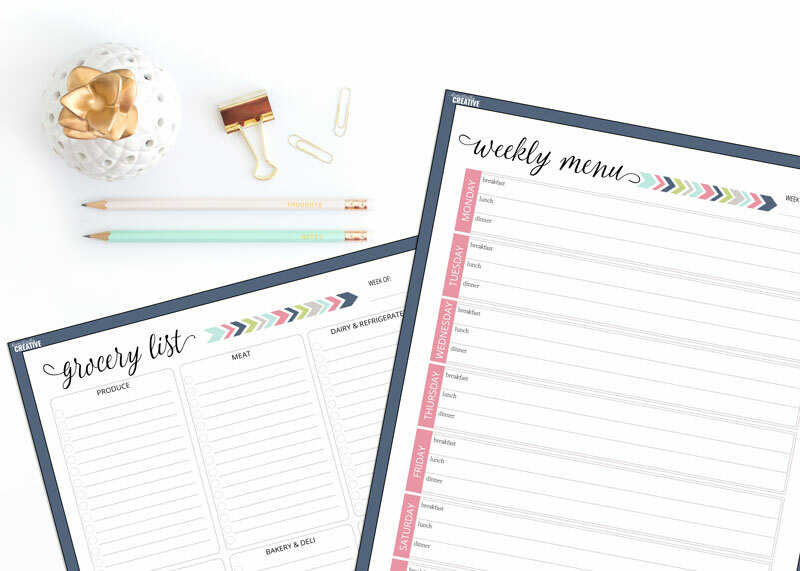 With this printable meal planner you’ll be able to better plan your meals, organize your grocery list and keep track of everything you have in the fridge, pantry and freezer. No more wandering the grocery store aisles aimlessly. No more buying food that will ultimately go to waste, or wondering what on earth you are going to make for dinner. Plan out your meals a week or a month at a time, it’s completely up to you! I personally prefer to plan out our dinner menu for the entire month, then I use the weekly layout to finalize everything including lunch and dinner. Then I will make my grocery list and head to the store. Easy and it keeps me on track with our budget. Plus I’m less likely to forget something. To start taking control of your family’s meal time, and get your FREE printable meal planner, subscribe below. You’ll not only gain access to the printable meal planner for download, but you’ll get my weekly email newsletter packed full of helpful recipes, tips and monthly meal plans. You’ll also be given access to the member exclusive printable library that is always being updated. Just subscribe below! Looking for Meal Plan ideas? Make sure to check out my monthly meal plans page. I subscribed and never got the link for the meal planner. Hi Amber, I don’t see your email in my subscriber list. You could try signing up again, maybe the request did not go through the first time. Sorry for the trouble. I have tried to download the printables multiple times and it comes up as an error? how can I get these? Hi there! I’ve signed up several times but I am not getting the email. I attempted to sign up for the meal planners but I’m not getting an email. Hi Marissa! I do see your email as registered, and the welcome email was sent and opened. Maybe you ended up finding it after all! Please let me know if you have any further issues! I subscribed twice and never got the email. Hi Kiley! I see that you are subscribed and the welcome email was sent. I can try resending it, but perhaps it might be in your spam folder? Nevermind! Got it to work! Thanks! I’m trying to reprint pages of the meal planning binder so I re-subscribed but am already a subscriber. Can you email me the link again? Thank you!! Hi there! I subscribed now twice and still have not received the weekly meal planner printable! Hi Bethany! I looked into your subscription and it looks like the initial confirmation email failed to send. I re-added you so you should be receiving the email soon! I subscribed, but can’t get the printable planner to download. Hi Wanda! I’m sorry you’re having such trouble. Sometimes the download won’t start if you have a pop-up blocker enabled. Hope that helps! Hi, I’ve subscribed but I don’t seem to be getting the email? Thanks! Hi Kailey! It looks like the email to confirm your subscription was sent yesterday. Is it possible it may have went to your spam or junk folder? Hi Pat! It looks like the confirmation email was sent, but you did not confirm your subscription. Perhaps the confirmation email went to your SPAM or JUNK folder? Please let me know if you still have trouble after that! Hello! I received my confirmation email but have not received the download info for your meal planning workbook. Does this usually take some time? It’s been a few hours. Thank you!